Schema of a hypothetical hypercycle. Each red loop represents an individual autocatalytic system. The dashed arrows in green indicate the amplifying effect of one autocatalytic component on another. Hypercycles are claimed as a possible evolutionary precursor to living cells. They are an attempt to show how life can originate by natural process. They are hypothetical non-biological autocatalytic chemical reaction cycles of the substances thought to be needed for the spontaneous generation of life. They are an attempt to extend Darwinian evolution to the origin of life. The idea is that these hypercycles would build up by mutation and natural selection all of the substances and ultimately the processes and structures of living cells. They are a purely and rather simple mathematical model that lacks any detail. They are entirely speculative, with no apparent real world basis. These so called hypercycles have never been observed in nature or even produced in a lab. Hypercycles are just another in the long line of Evolutionary just so stories that are invented to try to explain the origin of life by natural processes. The hypercycle model was a highly speculative schema proposed by Nobel Prize in chemistry, Manfred Eigen along with his graduate student Peter Schuster. 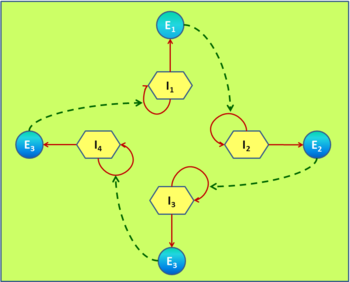 The hypercycle model is a particular class of self-replicative reaction networks and can be characterized by topological methods. The hypercycle is a cyclic reaction scheme, wherein each replicator acts as a catalyst for the replication of the following, until the last which then assists in replication of the former, thus completing a cycle. Hypercycle elements should be simultaneously catalysts (enzymes) and replicators. They must have the ability to replicate itself and produce enzymes, that means, have a metabolism. Only ribozymes, RNA molecules with catalytic functions, possess these characteristics. The scheme is basically as follows: The information carrier Ii (a RNA matrix) has the capability to instruct two things: its own replication and the production of enzyme Ei. These enzymes catalyze the reproduction of the next information carrier Ii+1 and so on until the information carrier In being able to catalyze the replication of the first information carrier so as to restart the cycle. Hypercycle disrupted by mutation on one of the ribozymes. I2 became a parasite mutant. One of the harshest criticism of the hypercycles scheme that is raised by biologists, including evolutionists, is the possibility or even the inevitability of mutants arise at any step of this process. These mutants can act as parasites interrupting the cycle. For example, a mutant generated by ribozyme I2 can still be catalyzed by the enzymes produced by I1 but not longer be capable of catalyzing replication of the information carrier I3 (see figure beside). ↑ Gitt, Werner (2005). In the Beginning was Information: A Scientist Explains the Incredible Design in Nature. Green Forest, AR: Master Books. p. 29. ISBN 978-0-89051-461-0. ↑ Truman, Royal (2006). "Searching for Needles in a Haystack". Journal of Creation 20 (2): 90. ISSN 1036-2916. ↑ Eigen, M., and P. Schuster (1978). [http://jaguar.biologie.hu-berlin.de/~wolfram/pages/seminar_theoretische_biologie_2007/literatur/schaber/Eigen1978Naturwissenschaften65a.pdf "The Hypercycle: A Principle of Natural Self-Organization - Part B: The Abstract Hypercycle"]. Naturwissenschaften (Springer-Verlag) 65: 7-41. ISSN 0028-1042. http://jaguar.biologie.hu-berlin.de/~wolfram/pages/seminar_theoretische_biologie_2007/literatur/schaber/Eigen1978Naturwissenschaften65a.pdf. ↑ Schuster, Peter; Stadler, Peter F (1999). "1: Nature and Evolution of Early Replicons". In Domingo, Esteban; Webster, Robert G.; Holland, John. Origin and Evolution of Viruses. London: Academic Press. p. 3. ISBN 0-12-220360-7. ↑ Eigen, M., and P. Schuster (november 1977). [http://jaguar.biologie.hu-berlin.de/~wolfram/pages/seminar_theoretische_biologie_2007/literatur/schaber/Eigen1977Naturwissenschaften64.pdf "The Hypercycle - A Principle of Natural Self-Organization - Part A: Emergence of the Hypercycle"]. Naturwissenschaften (Springer-Verlag) 64 (11): 541-565. ISSN 0028-1042. http://jaguar.biologie.hu-berlin.de/~wolfram/pages/seminar_theoretische_biologie_2007/literatur/schaber/Eigen1977Naturwissenschaften64.pdf. ↑ 6.0 6.1 Wicken, J.S. (December 1985). "An organismic critique of molecular Darwinism". J. Theor. Biol. 117 (4): 545-561. ISSN 0022-5193. http://www.ncbi.nlm.nih.gov/pubmed/2419704. ↑ Albrecht Moritz (October 31, 2006). "The Origin of Life". http://www.talkorigins.org/faqs/abioprob/originoflife.html#hypercycles. Retrieved 08-19-2013. Figure representing a hypothetical emergence of hypercycles. Eigen & Schuster (1977) The Hypercycle. A Principle of Natural Self-Organisation. Part A: Emergence of the Hypercycle. Naturwissenschaften Vol. 64, pp. 541–565. Eigen & Schuster (1978) The Hypercycle. A Principle of Natural Self-Organisation. Part B: The Abstract Hypercycle. Naturwissenschaften Vol. 65, pp. 7–41. Eigen & Schuster (1978) The Hypercycle. A Principle of Natural Self-Organisation. Part C: The Realistic Hypercycle. Naturwissenschaften Vol. 65, pp. 341–369. This page was last modified on 4 August 2015, at 00:08.